Last weekend, we were inspired by millions of people — including thousands of Presente members like you — who took to the streets to protest President Trump's inhumane policies of separating and caging immigrant children and families. We raised our voices and affirmed that #FamiliesBelongTogether! And now, much work lies ahead. The reality is that these horrible child and family prisons exist because private corporations like Wells Fargo and other banks keep lending them money to build and operate. Tell Wells Fargo: Not in our name! Migration is a human right! Can you help sustain the work? Contribute to #FreeThe4th. As long as there are financial and political incentives to cage children and families, Trump will continue to do so under the lie of immigration enforcement. Families fleeing poverty and violence in Central America have reached our shores for refuge1, only to find that the private prison industry and its funders like Wells Fargo are raking in $Billions off the backs of these families' pain. 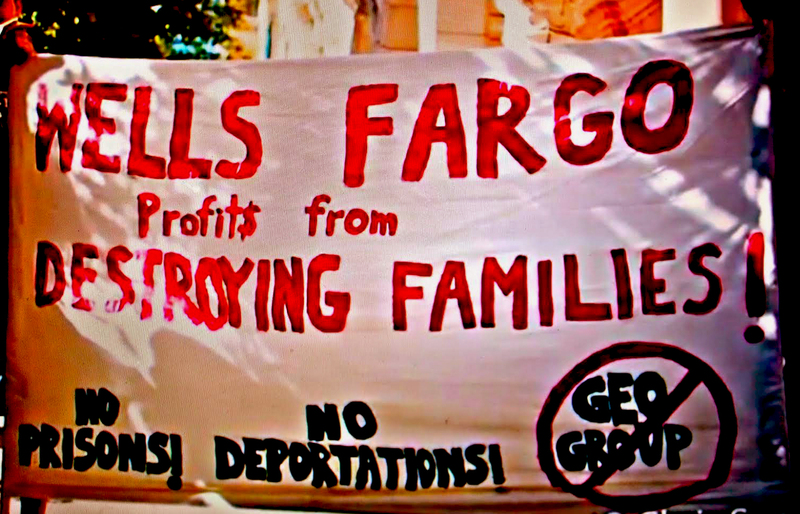 Tell Wells Fargo to stop profiting off the pain of families seeking refuge! Can you help sustain the work? Contribute to #FreeThe4th. Two of the private prison industry's main profiteers, CoreCivic and GEO Group, depend on debt financing from banks like Wells Fargo to conduct their day-to-day business operations, finance new facilities and acquire smaller companies. An analysis of U.S. Securities and Exchange Commission (SEC) filings over the past 10 years shows that Wells Fargo has played a leading role in financing these debts.2 In doing so, Wells Fargo is complicit in and profiting from mass incarceration and Trump's inhumane immigration policies. Take action to defund the private prison racket today. Tell Wells Fargo to stop profiting off the pain of immigrant families. Now that the plight of our families is front and center in the press and in the nation's consciousness, it is important that we let Wells Fargo know that their role in the pain and suffering of immigrant families is shameful and completely unacceptable. Together, we can undo an unjust and inhumane private prison complex one company at a time.